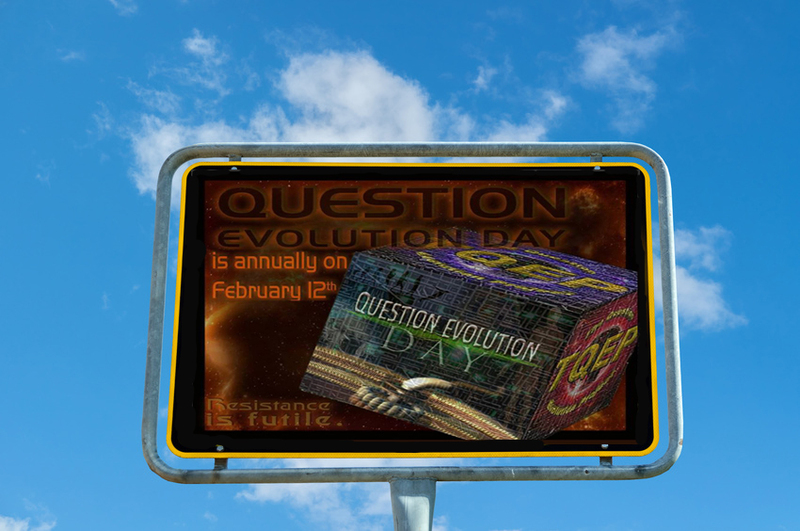 Creation Ministries International has published an excellent article titled “15 Questions for Evolutionists” that covers well many of the unanswered challenges to evolutionary theory. Also for your consideration: a few years back Buzzfeed did a “listicle” featuring creationists asking questions that are either problematic for evolution or supportive of creation. The questions sought to expose a problem with evolutionary theory, but were asked in a manner that made them easy to refute, so I wrote an article to fine tune the questions called “Refining the Questions for Question Evolution day.” It’s in the spirit of these articles that I offer a few more questions (and challenges to evolutionists) for Question Evolution Day. Question: Why do evolutionists tell stories instead of make predictions? As physicist Michio Kaku points out above, science – by which he means operational science – should be falsifiable. That means that any theory should be specific enough that you can either produce a model based on it, or make predictions based on it – either of which should be falsifiable based on actual observations. If you cannot test a theory in this manner, it is not real operational science. For instance I could have a theory that water is not always a liquid: at some temperatures it is a solid, and at others it’s a gas. You could test this theory by exposing water to extremes of temperature where you would find it becomes a solid at 32°F and becomes a gas at 212°F. Thus your tests would both confirm the theory and provide further detail – limiting details to the theory. What Leroi has unwittingly admitted is that evolution is not an operational science. It is a historical science. It seeks to explain things in the past. Therefore it cannot, and does not carry the same level of certainty or authority as other testable, verifiable and falsifiable sciences such as physics or chemistry. Many evolutionists chafe at descriptions by creationists such as Ken Ham when they correctly distinguish between operational sciences and historical sciences. Such don’t like the distinction because they want evolution to appear to be as certain, as reliable as hard sciences like physics or chemistry. But it simply is not, and by its nature will never be. Anyone trying to tell you differently is trying to pull a fast one on you. They’re trying to make evolution seem more certain and accepted than it is. But the facts are simple: Darwinian evolution is not “testable, reproducible, and falsifiable.” That’s why they don’t make predictions. And that’s also why it does not carry the certainty of operational science many would like you to believe that it has. Evolutionists cannot make accurate models or predictions. So they do the only thing left for them to do: tell stories. My advice to you: beware the scientist bearing un-provable just-so stories instead of verifiable theories and reproducible results. Question: Why do evolutionists use the language of design when speaking of evolutionary processes since they deny any design is involved? Another widespread erroneous view of natural selection must also be refuted: Selection is not teleological (goal-directed). Indeed, how could an elimination process be teleological? Selection does not have a long-term goal. Also there is no known genetic mechanism that could produce goal-directed evolutionary processes. To say it in other words, evolution is not deterministic..
Why are these evolutionists talking about “design” and “blue prints” and most amazingly – the brain doing trigonometry?! Trigonometry? The non-material, mathematical set of ideas – that trigonometry? How does materialistic evolution operate on those non-material concepts? How does non-goal oriented evolution decide to put that non-material ability into the brain? How do random material mutations – accidents – accurately encode the very specific principles, properties and benefits of trigonometry into the brain? Evolutionists have no answer to this. All they can give you are more just-so stories. The language of design is regularly used by evolutionists because the impression of design is obvious and overwhelming. and the use of words of chance or luck would look foolish and unscientific (which they are). Question: How do evolutionists explain vision capable of the extraction of 3D information from 2D images – without a designer, purpose or goal to do so? This talk of binocular vision in order to gain depth perception got me to thinking. How do evolutionists explain the process that brought about the ability to see one coherent 3D image from two different 2D images? Remember, you cannot invoke a designer, or a sophisticated algorithm to achieve that goal. Indeed, you cannot even have a goal. All you have – in the case of a creature are 2, two dimensional images of the same scene, seen from a couple of inches apart. How do you turn those two 2D images into 1 – 3D image? Remember – no design, no formulas, no programs, no algorithms, no goal and no purposes allowed. All you have to work with is random mutations and “selection pressures”. That’s what the evolutionists insist. Also remember – since there are no goals, there can be no selection pressures on intermediate steps that do not produce a beneficial outcome. So if it takes a sequence of a thousand changes, but you only get the benefit from the last change, then natural selection is unable to select the first 999 changes. Given that, how does the creature ever arrive at the final change? How does the ability come about? Here’s a similar problem. Here is a link to a random dot stereogram  that has embedded 3D information. If you’re able to do so, you can extract the 3D info embedded in the image that will allow you to see the 3D objects hidden in the image. (I guarantee the 3D info is there, but it requires binocular vision to see it.) Questions for evolutionists: Where does the brain get the information, the mathematical algorithm to extract such images? How does that ability get encoded into the brain using random processes? Indeed how does that ability also get encoded into the genes so that the ability to extract that information is passed to offspring? Remember, no planning, design or purpose allowed in your explanation. Question: Why will evolutionists not acknowledge the problem of the information enigma? Many have compared the information in DNA to the digital information stored in computers. This apparently is very threatening to Evolutionists – threatening enough for them to create a false narrative, a straw man argument. The false argument goes like this. Again, the point is DNA “contains information” and that information exists in the form of a chemical code. Okay, so now we’ve got the claim straight. It’s not that DNA is a code, the claim that has been substantiated is that DNA contains coded information. Given that fact some obvious questions (the information enigma) are immediately apparent. Where did the information that’s encoded come from? Where did the design of DNA – the most efficient information storage and retrieve system known to man – bar none – come from? How did the information get coded into DNA for use of the offspring of living creatures? Once again the evolutionists have no answers to these questions. All you hear from them is crickets as they say. 10. 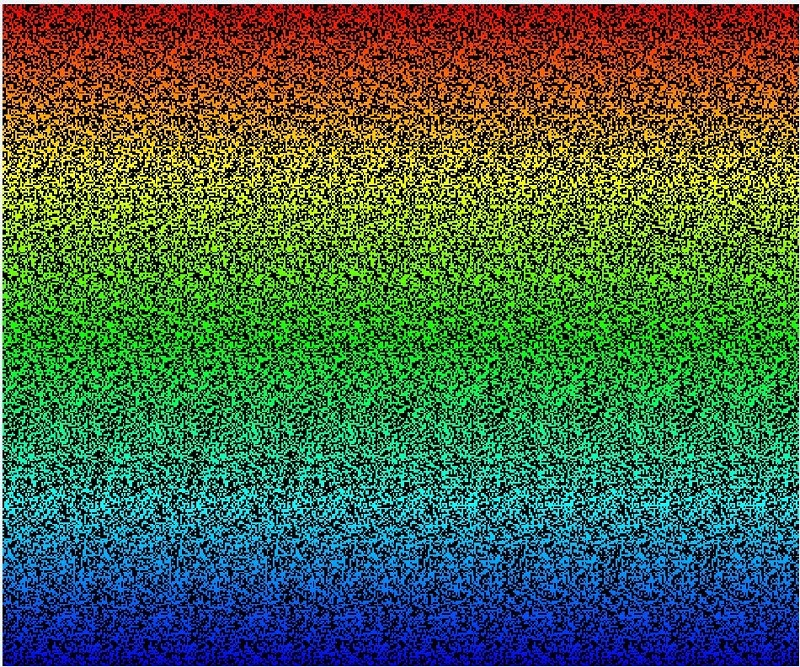 This random dot stereogram was used in the article Can you find what you Deny Exists? Three Guarantees to make a point about certain things not happening unless there is a purpose to do so. Purpose (and the mathematical algorithm to do so) is also required to extract the 3D information from the stereogram – and neither purpose nor math are allowed to evolutionists. This entry was posted in Biology, Darwin, DNA, Evidence, Evolution, Falsification, Intelligent Design, Question Evolution Day, Science, Scientific Method and tagged Armand Marie LeRoi, Ernst Mayr, Francis Crick, Michio Kaku, Richard Dawkins, Stephen Meyer by Duane Caldwell. Bookmark the permalink.